The National Labor Relations Act of 1935 (49 Stat. 449) 29 U.S.C. 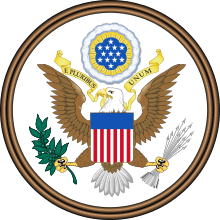 § 151–169 (also known as the Wagner Act after New York Senator Robert F. Wagner) is a foundational statute of United States labor law which guarantees into trade unions, engage in collective bargaining for better terms and conditions at work, and take collective action including strike if necessary. The act also created the National Labor Relations Board, which conducts elections that can require employers to engage in collective bargaining with labor unions (also known as trade unions). The Act does not apply to workers who are covered by the Railway Labor Act, agricultural employees, domestic employees, supervisors, federal, state or local government workers, independent contractors and some close relatives of individual employers. 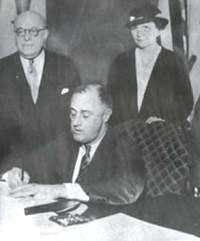 President Franklin Roosevelt signs the act on July 5, 1935. Secretary of Labor Frances Perkins (right) looks on. Under section 1 (29 U.S.C. § 151) of the Act, the key principles and policy findings on which the Act was based are explained. The Act aims to correct the "inequality of bargaining power between employees who do not possess full freedom of association or actual liberty of contract and employers who are organized in the corporate or other forms of ownership association". To achieve this, the central idea is the promotion of collective bargaining between independent trade unions, on behalf of the workforce, and the employer. The National Labor Relations Board (NLRB), which is established in NLRA 1935 sections 3 to 6 (29 U.S.C. § 153–156), is the primary enforcer of the Act. Employees and unions may act themselves in support of their rights, however because of collective action problems and the costs of litigation, the National Labor Relations Board is designed to assist and bear some of the costs. Under section 3, (29 U.S.C. § 153) the NLRB has two basic functions: overseeing the process by which employees decide whether to be represented by a labor organization and prosecuting violations. Those processes are initiated in the regional offices of the NLRB. The General Counsel of the National Labor Relations Board give legal advice. Sections 4 (29 U.S.C. § 154) and 5 (29 U.S.C. § 155) set out provisions on the officers of the Board and their expenses. Section 6 (29 U.S.C. § 156) empowers the Board to issue rules interpreting the labor legislation. This will generally be binding, unless a court deems it to have acted outside its authority. "Employees shall have the right to self-organization, to form, join, or assist labor organizations, to bargain collectively through representatives of their own choosing, and to engage in other concerted activities for the purpose of collective bargaining or other mutual aid or protection, and shall also have the right to refrain from any or all of such activities except to the extent that such right may be affected by an agreement requiring membership in a labor organization as a condition of employment as authorized in section 158 (a)(3) of this title." It also excludes domestic workers and farm workers. "The Social Security Act of 1935 excluded from coverage about half the workers in the American economy. Among the excluded groups were agricultural and domestic workers—a large percentage of whom were African Americans." "Nothing in this subchapter, except as specifically provided for herein, shall be construed so as either to interfere with or impede or diminish in any way the right to strike, or to affect the limitations or qualifications on that right." Opponents of the Wagner Act introduced several hundred bills to amend or repeal the law in the decade after its passage. All of them failed or were vetoed until the passage of the Taft–Hartley amendments in 1947. More recent failed amendments included attempts in 1978 to permit triple backpay awards and union collective bargaining certification based on signed union authorization cards, a provision that is similar to one of the proposed amendments in the Employee Free Choice Act. Under the NLRA, unions can become the representative based on signed union authorization cards only if the employer voluntarily recognizes the union. If the employer refuses to recognize the union, the union can be certified through a secret-ballot election conducted by the NLRB. ↑ Lehman, Jeffrey; Phelps, Shirelle (2005). West's Encyclopedia of American Law (2nd ed.). Detroit: Thomson/Gale. ISBN 0-7876-6367-0. ↑ "National Labor Relations Act ("NLRA")". 29 U.S.C. §§ 151–169. July 5, 1935. ↑ Our Documents: 100 Milestone Documents from the National Archives. Oxford: Oxford University Press. 2006. pp. 162–163. ISBN 978-0-19-530959-1. ↑ Archived May 30, 2013, at the Wayback Machine. ↑ "Salary and Benefit Discussions Among Employees". Retrieved 2012-11-04. ↑ "Where Does NLRA Apply?". Retrieved 2012-11-04. ↑ "Know Your Rights". Retrieved 2012-11-04. ↑ Ravo, Nick (1999-05-20). "Ida Klaus, 94, Labor Lawyer For U.S. and New York, Dies". New York Times. Retrieved 2015-05-03. ↑ "Ida Klaus". Jewish Women's Archive. Retrieved 2015-05-03. Atleson, James B. (1983). Values and Assumptions in American Labor Law ([Pbk. ed., 1983]. ed.). Amherst, Mass. : University of Massachusetts Press. ISBN 0-585-25833-3. Dannin, Ellen (2006). Taking Back the Workers' Law: How to Fight the Assault on Labor Rights. Ithaca, N.Y.: ILR Press/Cornell University Press. ISBN 0-8014-4438-1. Gregory, Charles O. (1961). Labor and the Law 2d rev. ed., with 1961 Supplement. New York: Norton. p. 619. Morris, Charles J. (2004). The Blue Eagle at Work: Reclaiming Democratic Rights in the American Workplace. Ithaca, N.Y.: Cornell University Press. ISBN 0-8014-4317-2. Schlesinger, Arthur M. (c. 2003). The Coming of the New Deal: 1933–1935 (1. Mariner books ed.). Boston: Houghton Mifflin. ISBN 0-618-34086-6. F. L. B., Jr. (Mar 1941). "Reinstatement with Back Pay under the Wagner Act". 89 U. Pa. L. Rev. & Amer. L. Reg. (5): 648–660. doi:10.2307/3309199. JSTOR 3309199. Keyserling, Leon H. (1960–1961). "The Wagner Act: Its Origin and Current Significance". 29 Geo. Wash. L. Rev. : 199. Klare, Karl E. (1977–1978). "Judicial Deradicalization of the Wagner Act and the Origins of Modern Legal Consciousness, 1937-1941". 62 Minn. L. Rev: 265. Lynd, Staughton (1984). "Communal Rights". 62 Tex. L. Rev. (1417): 1430–1435. Mikva, A. J. (1986). "The Changing Role of the Wagner Act in the American Labor Movement". 38 Stan. L. Rev. (4): 1123–1140. doi:10.2307/1228578. JSTOR 1228578. Nathanson, N.L. ; Lyons, E. (1938–1939). "Judicial Review of the National Labor Board". 33 Ill. L. Rev. : 749. "Effect on the A. F. of L. -C. I. O. Controversy of the Determination of Appropriate Bargaining Units under the National Labor Relations Act". 47 Yale L. J. (1): 122–124. 1935–1958. doi:10.2307/791821. "The Proposed Amendments to the Wagner Act". 52 Harv. L. Rev. (6): 970. 1938–1939. doi:10.2307/1334189. JSTOR 1334189. Pope, J. G. (2004). "How American Workers Lost the Right to Strike, and Other Tales". 103 Mich. L. Rev. (3): 518–553. doi:10.2307/4141930. JSTOR 4141930. Pope, Jim (2006). "Worker Lawmaking, Sit-Down Strikes, and the Shaping of American Industrial Relations, 1935-1958". 24 Law & Hist. Rev. (01): 45–113. doi:10.1017/S0738248000002273. JSTOR 27641352. Warm, J. Louis (1938–1939). "A Study of the Judicial Attitude Toward Trade Unions and Labor Legislation". 23 Minn. L. Rev. : 256. Woods, Warren; Wheatley, Altha C. (1936–1937). "The Wagner Act Decision - A Charter of Liberty for Labor?". 5 Geo. Wash. L. Rev. : 846.